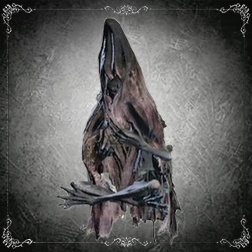 By far the weakest enemy in the Fishing Hamlet but also one of the most dangerous, these fishmen sit cross-legged on the ground and continuously launch large volleys of homing skulls which inflict arcane damage and have extremely strong tracking. A single attack of any kind will kill them and in fact they should be top-priority targets owing to the tremendous threat they pose at range, but they are usually surrounded by other enemies which must be dealt with before they can be reached with melee attacks. Before taking any offensive action against these foes, survey their vicinity for other enemies and determine the locations of any other potential threats. Find an object or terrain feature that can be used as cover and be prepared to retreat behind it to avoid an incoming cloud of skulls. Use the Monocular to aim a thrown weapon such as a Molotov Cocktail or Throwing Knife at the Fishman from behind cover before its next attack; it will generally be necessary to point the crosshairs well above the target itself in order to compensate for the projectile's arc, but in this way it is possible to eliminate these dangerous foes with relatively little risk. If most or all of the surrounding enemies have been eliminated, dash straight toward the target between volleys and strike with a single (R1) attack or a gunshot as soon as it is within range. There is a small zone in this enemy's immediate vicinity where the skulls cannot reach, affording a narrow margin of safety from which to eliminate it. Blue Elixir item is useful when closing the distance as it reduces their vision.